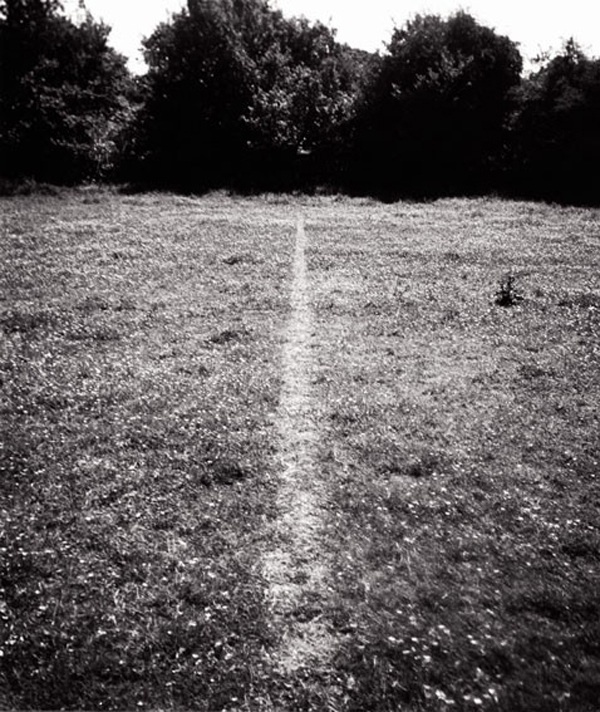 Richard Long – A Line Made By Walking. A man walks and walks, and keeps on walking but what does he create, what does he leave behind? A line in a field that leads towards, or away from trees. A line that could have been made yesterday, a thousand years ago or tomorrow. There is no cultural trace that pinpoints time. It is a subtle rub of human endeavour that was made in our time but talks with the past. A single note that sounds back to a dark song of the ancestors – scratching around and exploring their untested earth in excited fear. There are also closer echoes, for me. Reminiscences of boyhood touchlines – penalty box boundaries or hard-beaten escape routes to the woods, the burn and the den. I know a little of Richard Long and his working methods. But if you came across this line with no back story what would you think? You would be aware of a human presence but perhaps not how it came to be there, what it’s purpose is or if indeed there is one. A line on the earth resonates with most people. Is it a benign boundary or a troubled border, murderously argued between warring nations. The thing that makes us ‘us’ and them ‘them’. Take it away and what happens? A loss of tribe or a gaining of community? Or just confusion? So often a line is used as a marker to control chaos. The line may not divide at all but may be a link – between here and there, a current state and an aspirational one – a journey in itself through variable zones both physical and mental, the original psychogeography. Paul Klee famously took a line for a walk – Long took a walk for a line and with it rediscovered the beginning of all possibility – then let it disappear.